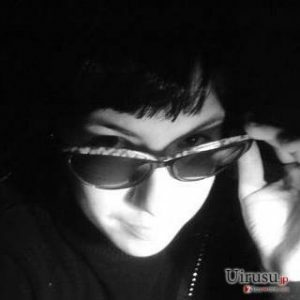 Spiteful Doubletake ransomware is cryptovirus that demands 500$ but is not giving your files back. You should remove the malware with all related files and virus damage at the same time, using a reputable anti-malware tool. Spiteful Doubletake ransomware is a file-locking virus that is accepting your money but not recovering your files. Spiteful Doubletake ransomware is the malware program that delivers ransom note in a program window. Unfortunately, the message delivered on the window states about the ransom demand and file encryption. At first, it seems that you should pay 500$ for the decryption, but when you transfer Bitcoins to the provided address, you are not getting your data back. In yet another program window virus developers state that they will take your money but not give your files back. When this program encodes users data, it marks data using .enc extension and opens mentioned windows to inform about the attack. The virus is written in Perl and uses CBC and the Blowfish key for encryption. It may be a test or at least for the meantime because hardcoded key “SOC ransomware test. 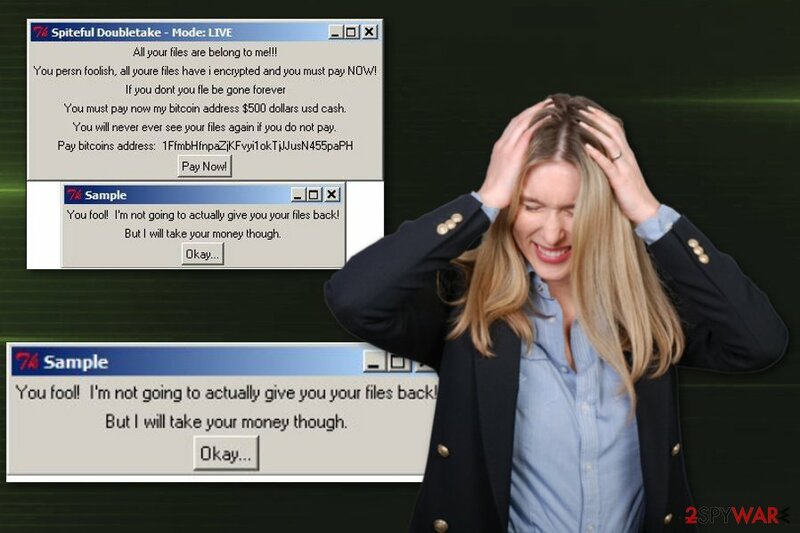 Since Spiteful Doubletake ransomware belongs to the cryptovirus family, it is known that the initial attack starts with infiltration from the malicious email. When you download and open the infected file, it delivers Spiteful Doubletake (LIVE).exe – the main ransomware payload. When this file is launched on the system, Spiteful Doubletake ransomware virus starts scanning data stored on the computer to find pictures, documents, archives or databases to encrypt. The whole encryption process changes the original code of your files and makes data locked without the opportunity to open. You should remove Spiteful Doubletake ransomware as soon as possible because you can lose your data. Virus developers state in the first place that there is no file recovery possibility, so you would pay for nothing. Even when ransomware developer promise to recover encrypted data, they might disappear after the money transfer. All your files are belong to me!!! You persn foolish, all youre files have i encrypted and you must pay NOW! You must pay now my bitcoin address $500 dollars usd cash. You will neuer euer see your files again if you do not pay. Spiteful Doubletake ransomware elimination may take time if you try to find all related files and delete them manually. In most cases, it is not possible at all because ransomware adds various data in system files and launches additional processes that affect functions or programs. We can also recommend scanning the system again using PC repair tool like Reimage, so you can repair virus damage or fix any issues related to ransomware attack. For automatic Spiteful Doubletake ransomware removal, use a professional anti-malware program and scan the system thoroughly. This way you can delete all related files or suspicious programs. Researchers also advise choosing reputable PC repair tools to check the system further and clean possible virus damage. Spiteful Doubletake ransomware virus is a program that uses army-grade encryption algorithms to encode various files on the system. Phishing techniques recently took place as one of the most common methods of malware spreading. This spam email campaign style is well known as the method used to distribute notorious malware like ransomware. Safe-looking emails with legitimate senders look harmless, and people don't pay enough attention to attachments. Unfortunately, when the user downloads and opens document or archive attached to the email, malware downloader automatically launches and infiltrates the system. You can avoid these cyber infections if you clean the email box more occasionally. You can delete the questionable email immediately when you get it and look for red flags like grammar mistakes, broken English or suspicious content attached. 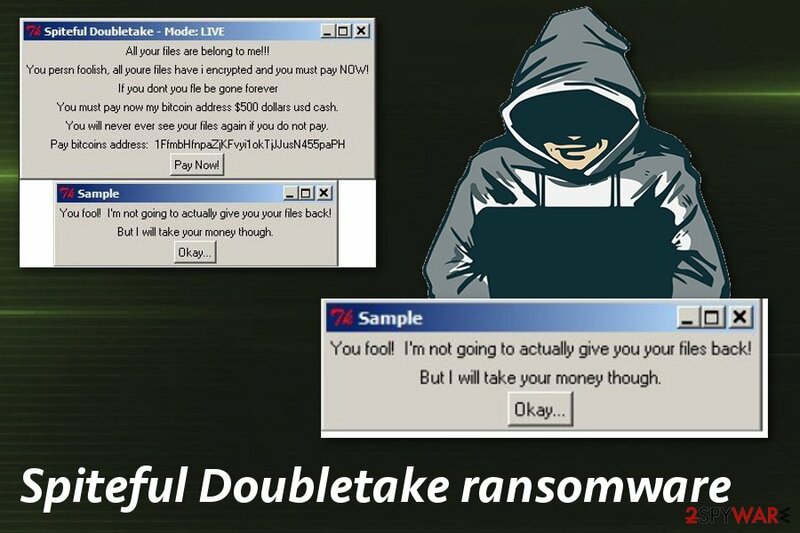 Unfortunately, Spiteful Doubletake ransomware virus is one of the most dangerous and persistent cyber threats what makes it more difficult to get rid of permanently. Additional changes on the system also affect the virus termination process, so restart your device in Safe Mode before scanning the system or try System Restore feature. The best tip for Spiteful Doubletake ransomware removal that we can give you is to use reputable and trustworthy anti-malware for this job. It is important because you need a powerful tool that can detect and remove this notorious virus. Spiteful Doubletake (LIVE).exe might be one of many executables that you need to terminate. Remove Spiteful Doubletake ransomware using your antivirus, use a few different programs to double-check. Then, you can focus on virus damage termination using programs like Reimage, Malwarebytes MalwarebytesCombo Cleaner or Plumbytes Anti-MalwareMalwarebytes Malwarebytes and ake your device safe and malware-free again. After all these steps, you can recover your data using backups or appropriate data recovery software. Log in to your infected account and start the browser. Download Reimage or other legitimate anti-spyware program. Update it before a full system scan and remove malicious files that belong to your ransomware and complete Spiteful Doubletake removal. When a new window shows up, click Next and select your restore point that is prior the infiltration of Spiteful Doubletake. After doing that, click Next. Once you restore your system to a previous date, download and scan your computer with Reimage and make sure that Spiteful Doubletake removal is performed successfully. Guide which is presented above is supposed to help you remove Spiteful Doubletake from your computer. To recover your encrypted files, we recommend using a detailed guide prepared by 2-spyware.com security experts. ^ Blowfish (chiper). Wikipedia. The free encyclopedia. ^ Usunwirusa. Usunwirusa. Spyware related news. ^ Bill Brenner. Latest phishing tactics: infected PDFs, bogus friend requests, fake HR emails. Nakedsecurity. Computer security news, advice and research. This entry was posted on 2019-02-05 at 01:38 and is filed under Ransomware, Viruses. You can quickly scan the QR code with your mobile device and have Spiteful Doubletake ransomware manual removal instructions right in your pocket. How did you remove Spiteful Doubletake virus?